How to manually fix 13 of the most common reasons your computer is so slow. As an alternative, our PC Matic product automates many of these same tasks. You decide how much ‘heavy lifting’ you want to do.–PC Pitstop. 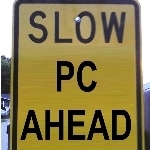 Computers slow down for any number of reasons, but most of those boil down to one thing – us using them. As you download programs, install extensions, surf the web, create files and fill your hard drive with movies and music, inevitably you’ll build up virtual detritus that will impact your PC’s performance. Happily, much of that impact can be mitigated with better electronic hygiene habits. We had a chat with Joe Silverman, CEO of repair shop New York Computer Help about the most common reasons your computer is slowing down – and the simple measures you can take to get its groove back. Not all browser extensions are created for good. “People often assume a slow computer is because of a virus, but a lot of time it’ll be a browser add-on or plugin bundled with a free software download,” Silverman says. These add-ons may proclaim themselves popup blockers or search protectors, but they’re actually browser adware that can slow your computer down by downloading ads and popping up ads every time you open your browser. Firefox: Hit the menu button on the far right, select Add-ons / Extensions, then select disable or remove for each item on the list. Chrome: Right-click on any extension button / Manage Extensions, then uncheck the box to disable a particular item, or click the trash can to wave it goodbye. Safari: Hit Safari (top left) / Preferences / Security / Extensions, then select an item to uninstall. You can also turn off all Extensions here. Internet Explorer: Tools / Manage add-ons / Show All add-ons, then select the offender(s), and click disable or remove. “Hard drives have moving parts, so they all fail eventually,” Silverman says. “There’s no way to guard against it except backing up your files.” As for solid state drives (SSDs), which don’t have moving parts and are theoretically less likely to break down, “that’s kind of a myth,” Silverman says. While they may not suffer mechanical breakdown, their data can still be corrupted. “When they do fail, it’s much more difficult to recover the data,” Silverman says. Run a hard drive check, says Silverman. He recommends installing a program called HDTune that runs a health check on your hard drive to diagnose it healthy or ailing. Avoid dropping, throwing or otherwise causing impact to the hard drive to extend its lifespan. Doing a trillion things at once is exactly why we have computers but, at some point, your little bundle of artificial intelligence is going to falter. Your computer’s ability to run multiple programs at the same time hinges in part on its RAM (random access memory), which allows it to switch from processing one program to another with seeming fluidity, but if the demands of the open programs are outstripping your computer’s memory and processing power, you’ll notice a slowdown. “Lots of folk have to keep in mind not to have too many windows open,” Silverman says. That includes minimized windows, which continue to run in the background, sucking up processing power. Shut ’em down. In Windows 8, programs are built so that they run in the background for a while, then automatically shut down. But if you want to manually shut one down and ensure all associated files shut down with it, drag from the top of the screen to the bottom, and hold there until the icon flips over. It never hurts to teach/remind people of the basics! Lol, to me these are "duh" reasons. But I definitely know ppl who are clueless which is why I will be sharing.